There once was a long-standing tradition held by the Maasai people of Kenya and Tanzania. When a young boy became of age, he would be sent out by his tribe on a special mission. The boy was expected to kill a lion with nothing more than his wits and a spear. This was his rite of passage. This is how the young boy would earn the approval of his tribe and become a man. The bigger the lion, the bigger the man. Although this tradition may seem foreign to us, I fear that something quite similar is happening in our church culture here in America. This constant need to prove ourselves can be seen from the preacher in the pulpit to the nursery worker caring for our children. The lion has been replaced with ministry. And in ministry, church planting is the biggest lion of all. This constant need to prove ourselves can be seen from the preacher in the pulpit to the nursery worker caring for our children. I was born to a single woman who felt that she was unable to care for me, so she decided to give me up for adoption. The couple who adopted me was unable to conceive a child of their own, but less than a year after I was adopted, whatever was inhibiting them from conceiving a child was removed. In a few short years, I had become the oldest of four with all three of my younger siblings being the biological children of my adopted parents. In order to protect me from feeling inferior to my natural born siblings, my parents consoled me by continually reminding me that I was very special. They told me that I was chosen. Thanks to their intentional and loving parenting I grew up proud of the fact that I was adopted. And yet, I always knew that in order to be chosen by one set of parents, a child must be forsaken by another. Although my biological mother’s intentions for giving me up were noble, I still felt an underlying sense of rejection from the very beginning of my life. At an early age, I found myself desperately longing for the approval of others. In elementary school, I was the daredevil. I would climb higher, hold my breath longer, and devour more insects than any other kid in my class. In junior high I evolved into the comedian. There was nothing I would not do for the laughter of my friends. But by the time I arrived in high school I had run out of tricks. However, I slowly began to discover an untapped niche for a unique quality I had never truly considered before – spirituality. Not only had I found something that I could be the best at, but it was also reasonably easy to prove that this something was more valuable than everything else. My life’s philosophy was simple – be the best. If I couldn’t beat someone at something, I would ferociously try to convince them that the thing they were gifted at wasn’t valuable and then beat them at something that was. And thus, a call to ministry was born. If I couldn’t beat someone at something, I would ferociously try to convince them that the thing they were gifted at wasn’t valuable and then beat them at something that was. In college, I remember a distinct sense of fear beginning to creep over my thoughts as the date of graduation grew closer and closer. I realized that receiving a Bachelors Degree in Biblical Studies and Business Management would not ensure me a lead pastor position of a church. I began to worry incessantly. What if I didn’t get hired for a job in ministry? What if I still wasn’t good enough? Even though my knowledge of God surpassed that of almost all the other students in my class, my personality was sub par. Several of the other students were more friendly, popular, and dynamic than I was. They stood a much better chance of being hired for a position such as youth pastor or college director. My giftings, however, seemed to be almost exclusively suited towards a lead pastor position. Teaching the Bible was my strongest suit by far, but no one hires a single man in his early twenties to be the lead pastor of a church. Whether right or wrong, once again I felt hopeless. Approval seemed like a distant dream that could never be achieved; that is until I heard of a magical loophole in the system… the holy grail of all vocational ministry assignments, and to top it all off, it was a self-appointed position – church planting. Approval seemed like a distant dream that could never be achieved; that is until I heard of a magical loophole in the system… the holy grail of all vocational ministry assignments, and to top it all off, it was a self-appointed position – church planting. I have one primary point in writing this article, but before I make it there are a few things you should probably know about church planters. It’s important that I preface this by saying that not all church planters fit this mold. However, there are many that do and I was definitely one of them. Perhaps the safest approach I can take here is to simply speak for myself. I loved to talk about how my church was uniquely different from everyone else’s. In order to gain people, I often monopolized on the frustration that people felt with the church at large. I would lure people in by promising that the grass was greener on my side of the fence. Perhaps the saddest part is that I actually believed this was the truth. This strategy helped me to gain a few people who genuinely loved God and were simply mistreated by the leadership and structures of another church. However, for the most part, this strategy did nothing more than fill my seats with a bunch of hyper-critical people. I campaigned almost exclusively around everything that my church was not, rather than who we actually were. I could not afford to build around who we were because I did not have the faintest idea of who that even was. I gained people by over-promising, but lost them when I inevitably under-delivered. I assured people that their negative past experiences with the church would never happen in my church, but I made these assurances without ever hearing the other side to their story. In many cases, I did not even think to question whether or not what I was being told by these people was the truth. I forgot that sometimes people lie. I forgot that some people are so broken and immature that they don’t even recognize their own delusions and that what they are saying is not reality. Very often, the reason a church plant fails is because it was built on the backs of rebellious men and women. The only reason my church survived was because of the grace of God. We had so many rebellious people. They filled my seats because there was a rebellious young man filling the pulpit. I was rebellious, and rebellious people only draw more of the same. These people always arrive with a short shelf-life because they arrive for the wrong reasons. They quickly grew disenchanted with my church and with me. Thanks to my pride, I had to learn this lesson the hard way. My team and I took quite a beating during those first few years of church planting. I experienced people’s disapproval on a regular basis. Rejection became a part of my daily routine. It’s probably necessary for me to add that, in addition to my sinful motivation, there were also some pure motives swirling around in the chambers of my heart. I truly believe that God has called me to vocational ministry, but it would be a bold-faced lie to say that this was the only motivating factor. My incessant need for approval and my desire to gain it through ministry caused ministry itself to become an idol. Becoming a successful pastor was not only something I longed for in order to bring glory to God, but also something I desperately needed in order to gain glory for myself. Very often, the reason a church plant fails is because it was built on the backs of rebellious men and women. The only reason my church survived was because of the grace of God. Here’s my point. 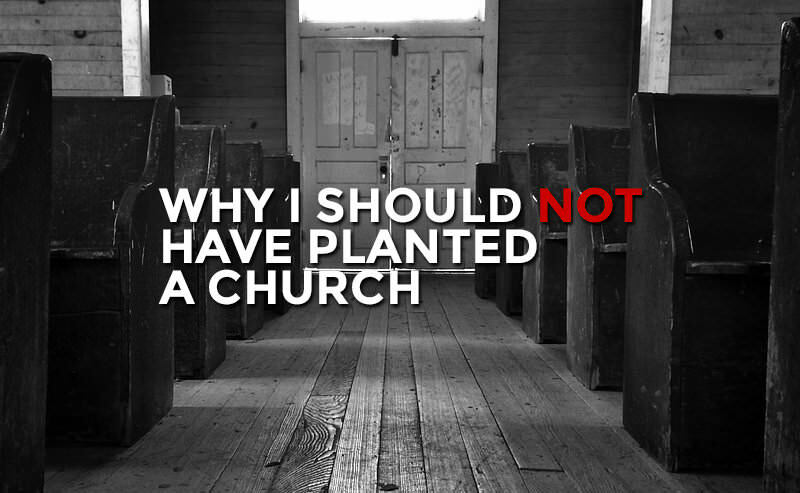 I could tell you story after story of the difficulty I’ve experienced in church planting. I could build a very believable case for why you should show me pity. I could tell you about how challenging it has been to plant a church as a single man without a spouse. I could tell you how I went years without ever receiving financial support from outside our congregation. If you sat down with me, I could probably convince you that my church planting story has been more difficult than anyone else’s. However, the only way I could do this is by sharing only half of the story. The other half of the story is this: I have been battling with a lifelong addiction to approval since the day I was born. Nobody forced me to plant a church as a single man in his early twenties without experience or support; I chose to do it. Some of you may wonder why. The answer is simple, I felt like I had to. I felt as though anything less would be selling out. I was convinced that my allegiance to doing ministry the hard way was rooted in virtue and devotion to Christ, but in reality it was rooted in a hunger for glory. Yes, I have a genuine call to church plant and have been supernaturally gifted for the task, but it was my hunger for glory that caused me to go about church planting the way that I did. I could have waited. I could have simply chosen to be faithful in a local church that desired to plant other churches and trusted that God would exalt me at the proper time. I made things so much more difficult for myself and my team than they actually had to be. I was unaware, but subconsciously I was nothing more than a boy trying to kill the biggest lion. I was convinced that my allegiance to doing ministry the hard way was rooted in virtue and devotion to Christ, but in reality it was rooted in a hunger for glory. Through all of this I have learned that I am not alone. I can smell this glory hunger on almost every church planter I meet. This disease has two symptoms that are easily spotted. The first symptom is this: A critical view towards others, especially those in ministry. Often young men plant a church out of a reaction to what they despise in preexisting churches, rather than out of a response to Jesus and his incredible love for his Bride. The second symptom is this: An insatiable need for recognition. There are countless church planters attempting to gain glory for themselves through a gospel-less rite of passage. They may have a partial desire to see God glorified and to see his people cared for, but at the deepest level of their heart they are still a boy trying to kill a lion in order to become a man. This sinful view is so tragic because it stands in direct opposition to the truth of the gospel. In the gospel, we see that there is a lion that is killed by us. However, we do not slay this lion with our talents, but rather with our sin. This lion willingly died so that we could share in his glory rather than striving for our own.